Good Morning! 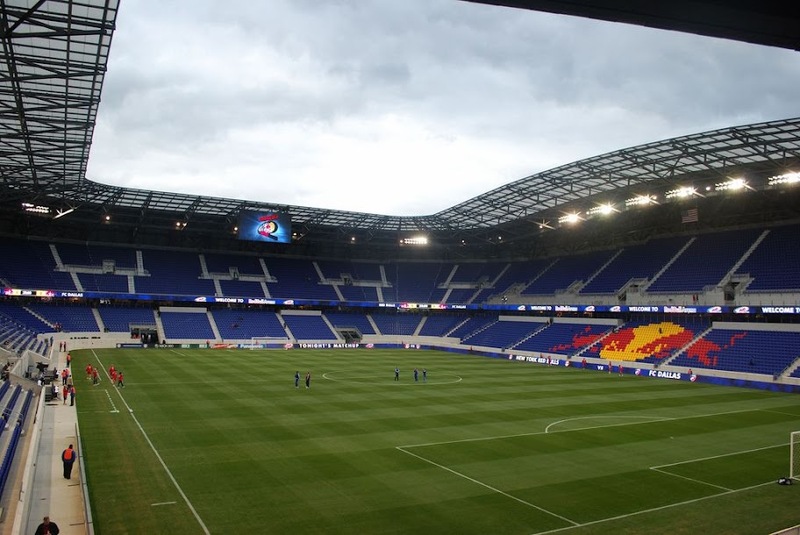 The Red Bulls are back in action @The Cathedral of Football. This time, it's the San Jose Earthquakes making their first visit here and sporting a brand new DP no less. The Earthquakes are coming off a big 1-0 win against their bitter Southern California rivals, the Los Angeles Galaxy. The Red Bulls are coming off a massive 4-1 rout of Toronto FC @BMO Field and will be looking to continue their winning ways. Thierry Henry will be desperate to tally his first MLS goal and Juan Pablo Angel will be desperate to catch Edson Buddle for the league scoring lead. Rafa Maquez, last week's MLS Goal of The Week winner, will look, once again, have another stellar perfomance in midfield. With all that in mind, let's get to some predictions. Greetings from Montreal, home of the 19th MLS club, Montreal Impact, though you wouldn't know it by walking around the city. Canadiens NHL stuff everywhere, but not a sign of soccer unless you check the standings in the paper. In any case, I should be back for the Red Bulls game on Saturday. After predicting a loss in Toronto and seeing us win handily, I'm tempted to forecast another defeat. But I've never really been superstitious, so I'll go for a 2-0 Red Bulls victory. Yes, San Jose are coming off a big win over LA, but that's only because Jon Busch stood on his head. As for their new DP Geovanni, I think it could take him some time to get in shape and adapt. So a win for us. Henry gets his elusive first goal and Dane Richards scores the other. I'm going to go with a big home win and three big points for the Red Bulls. I'm going to, once again, predict that TH14 breaks out of his scoring slump. I say he gets a brace and JPA gets one more. Final score: Red Bulls 3, San Jose 1. Revenge is a dish best served cold, and San Jose is coming to the Cathedral of Football at the wrong time--wrong time for them, that is. The Red Bulls, and fans, surely remember the embarrassing 4-0 loss we suffered at the hands of the Earthquakes earlier this season. San Jose received laudits for their 1-0 defeat of the Los Angeles Galaxy last Saturday, but their performance did not compare to the 4-1 destruction the Red Bulls unleashed on Toronto at BMO Field. Hans Backe's army, the finest assembly of talent in MLS, is beginning to gel, and we will put a hurt on San Jose. Look for a 3-1 Red Bull victory, with goals from Angel, Henry (it's gotta happen sometime! ), and Tim Ream on a set piece perfectly delivered by Rafa Marquez. I am predicting an historic demolition of San Jose as we send a message to the rest of the league that Mr. Backe's Viking Army intends to raise the rest of the league with no survivors. I say 7-0. Thierry Henry with at least a hat trick. And Ramiro Corrales gets stretchered off after a lot of verbal abuse! Another insane prediction from the great YSC. Shocker, eh? Ha, ha! But you know, one of these days one of those is bound to come true. Ok, see you @The Cathedral. Viper Out!